What is giving? What is stealing? Within Buddhism there are many ways to understand this. Literally, on its face; with an openness, acknowledging that when rules are rigid they can result in less compassion than if the rules are not adhered to; and further, with respect to time, place, person and position. 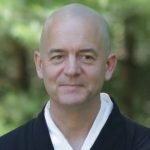 In this question and answer teaching, the sangha and Shugen Roshi explore, together, what this precept is, its many meanings, and the sometimes complicated ways in which we can apply it and it affects our lives. *Note: We experienced Technical Audio difficulties with this talk. There are some sections of the audio which we were unable to repair around 37:00-39:30, and 48:30. The second problem section included a lost question. Drawing on the teachings of Thich Nhat Hanh, Chan Master Sheng-Yen, and IMS Teacher Joseph Goldstein, Gokan offers insight into how we stop creating evil, practice good, and actualize good for others. How does zazen help us to do that, to stay in our own experience? And how do zazen and the precepts give each other life?